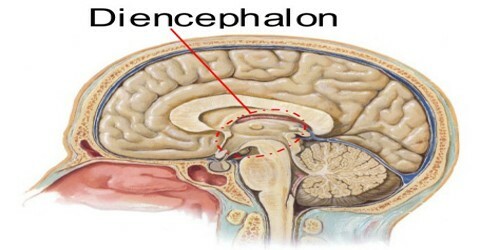 Diencephalon is the posterior part of the forebrain that connects the midbrain with the cerebral hemispheres, encloses the third ventricle, and contains the thalamus and hypothalamus. Diencephalon is also called betweenbrain, interbrain. 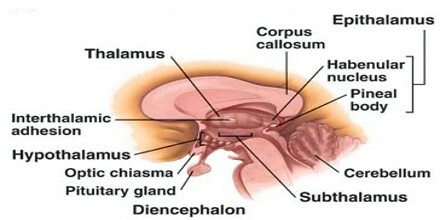 It is a part of the brain that includes the thalamus and the hypothalamus. It is the link between the nervous system and the endocrine system. The diencephalon receives signals from the nerves system and interprets the signals, and then the pituitary gland responds by excreting hormones. Diencephalon consists of structures that are lateral to the third ventricle, and includes the thalamus, the hypothalamus, the epithalamus and the subthalamus. It relays sensory information between brain regions and controls many autonomic functions of the peripheral nervous system. It also connects structures of the endocrine system with the nervous system and works in conjunction with limbic system structures to generate and manage emotions and memories. 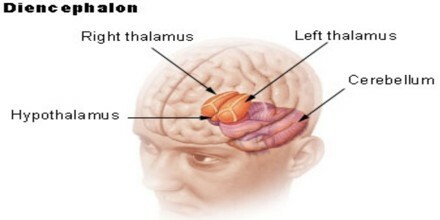 Thalamus – The thalamus is capable of a small amount of sensory interpretation. The cerebral cortex is responsible for refined tactile interpretation as well as the response to painful stimuli. The crude interpretation possible in the thalamus is not sufficient for the necessary enhanced tactile interpretation. The thalamus is responsible for a crude and immature interpretation of sensory awareness such as intense pain. It most likely contributes to the body’s reaction to intense and immediate pain while the brain’s cerebral cortex has time to take over to fine tuned reactions to pain. Psychological shock that often accompanies phenomenal pain is contributed by via the thalamus. Hypothalamus – The hypothalamus is quite small yet is still able to perform vital functions which are responsible for the regulation of visceral organs. The hypothalalmus is also responsible for emotional and instinctual reactive processes. It is a control center for many autonomic functions through the release of hormones. The hypothalamus is also responsible for the body’s water and electrolyte balance. Within the blood, the body has specialized receptors known as osmoreceptors which can detect electrolyte imbalances as well as indications of a lack of hydration. This is known as monitoring the osmotic levels within the blood. An anti-diuretic hormone can be triggered via the posterior pituitary gland when impulses from the hypothalamus are sent out. The body is then also triggered to become thirsty. Epithalamus – The thin roof is then lined with the vascular choroid lexus which is responsible for the production of cerebrospinal fluid. Named for its appearance, which is similar to that of a pine cone, the pineal gland is a small tissue mass which projects outwards from the posterior section of the epithalamus. While scientific studies have yet to confirm all of its functions, it is thought that this has a neuroendocrine function. Aids in sense of smell and helps to regulate sleep-wake cycles. Subthalamus – It is assists in motor control. The diencephalon is the region of the embryonic vertebrate neural tube that gives rise to posterior forebrain structures including the thalamus, hypothalamus, posterior portion of the pituitary gland, and pineal gland. The thalamus sends and receives signals to and from the brain and body. The brain sends a signal to the thalamus, which relays the signal to the body. Similarly, the body sends a signal to the thalamus, and the thalamus relays the signal to the brain.